The figure is highly variable, depending on geography and demographics, but on average it costs $0.025 to save a kilowatt-hour of electricity, according to research from Lawrence Berkeley National Laboratory. The analysis looked at efficiency programs funded by customers of investor-owned utilities. Costs were lower in the Midwest, where utilities have less experience with efficiency programs and more low-hanging fruit; in the Northeast, the cost reached $0.033/kWh, on average, because the region has several states with more developed efficiency programs. As utilities have focused on reducing emissions and cleaning up their energy mix, energy efficiency has become a key tool in achieving clean energy goals. Some 30 states and the District of Columbia have adopted efficiency policies, including two dozen that adopted an energy efficiency resource standard, the U.S. Energy Information Administration said last year. The concept of “low-hanging fruit” is fairly well-known in energy efficiency: Some improvements, primarily lighting, are easy to pull off, inexpensive, and can show big savings. But as more and more customers replace traditional bulbs, utilities must work harder to find savings. So as more efficiency is captured, the cost of further savings rises. The average U.S. retail price of electricity is about $0.104/kWh. LBNL’s research examined the cost performance of utility energy efficiency programs, utilizing data from almost 8,800 programs across 41 states between 2009 and 2015. It was the “most comprehensive effort yet to quantify the cost of saving electricity through efficiency programs,” researchers said. They concluded the average cost was $0.025/kWh. But the cost of saving electricity “varied significantly” among regions of the country. In the Midwest, the cost dipped to $0.015/kWh; in the Northeast, it rose to $0.033/kWh. The South and West were in line with the national average. In all, 16 states showed efficiency costs of $0.02/kWh or less. This tended to be true of states that were “new to energy efficiency, … or had program design restrictions that limited savings acquisition (e.g., caps on customer payback periods),” the study said. On the flip side, five states had costs above $0.04/kWh: Florida and four Northeast states. The most expensive customer segment, for a variety of reasons, was low-income households, where the costs reached $0.105/kWh. In low-income focused efficiency programs, researchers pointed out that program administrators typically pay the full cost of measures, and see higher costs due to poor home and safety conditions. 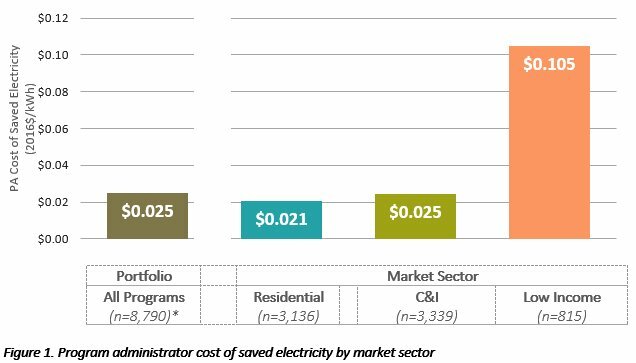 Commercial and industrial programs saw average costs of $0.025/kWh, with three types of programs making up almost three-quarters of of the sector’s savings: rebates for custom retrofits, prescriptive measures and new construction. According to LBNL, those programs show average costs from $0.019/kWh to $0.026/kWh.